Faced with a reality of living in a troubled neighbourhood, the government today allocated Rs 1,41,703 crore for defence, 34 per cent rise over the previous fiscal in one of the steepest hikes in recent years. In 2008-09, the total allocation for defence expenditure was Rs 105,600 crore which was later revised to Rs 1,14,600. And with a regular Budget expected after General Election, the allocation for 2009-10 is expected to rise further. This is the biggest ever hike in defence allocation in rupee terms since Independence. Notably, 13 per cent of the total expenditure of the government will be on defence in the coming fiscal. However, despite today’s hike, India will be spending just a shade above 2 per cent of its GDP on defence. In comparison, China spends 7 per cent of the GDP, while Pakistan spends 5 per cent. Presenting the Interim Budget, Pranab Mukherjee justified the hike and termed cross-border terrorism was a new dimension to the security needs of the country. It was amply clear that the interim Budget will focus on continuing fast-track upgradation of armaments and modernisation of the armed forces as the allocation on capital outlay has been pegged at Rs 54,824 crore. This in itself is a jack up of 33 per cent over last year’s capital allocation of Rs 41,000. Most of it will be used to upgrade the existing ageing fleet of aircrafts, naval warships, submarines, military equipment besides addition of radars, sensors and new weapons. 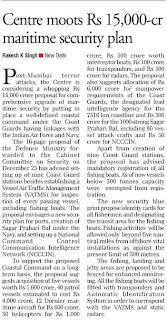 A part of the funds would be used for plans to strengthen coastal reconnaissance and coastguards along with expansion of and additional equipment for crack commando troops. The government would provide for any additional requirement for the security of the nation, Mukherjee asserted. Lieut-Gen Raj Kadyan (retd), a former deputy chief of the Army, welcomed the hike saying “top priority has to be on defence preparedness” In the capital outlay a sum of Rs 11,121 crore has been allocated for Army equipment. This is a substantial jump from Rs 6268 crore over the present year’s revised estimates. Another Rs 6891 crore is for IAF equipment and Rs 6840 crore is for the Naval fleet. Another significant increase is for the ordnance factories that will get Rs 672 crore. In the present year, the ordnance factories got just Rs 176 crore. 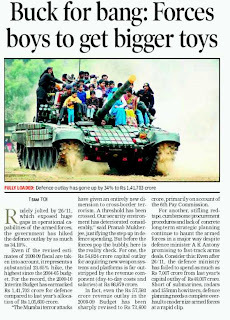 Excluding the capital outlay, the Army with a force strength of over 1.3 million continues to be biggest recipient of the defence budget with an allocation of Rs 58,648 crore for the year 2009-10. The allocation for Army has been raised by Rs 10,453 crore over the present year’s revised estimates. The allocation for Air Force has been pegged at Rs 14,318 crore while the Navy has been allocated Rs 8,322 crore. The Defence Research and Development Organisation have also received a boost of almost Rs 900 crore. The DRDO outlay has been pegged at Rs 4,757 crore against this years revised figure of Rs 3,844 crore. Today the only thing, mind you the only thing that can save Pakistan is for it to come out of its Brezhnev era mindset and outgrow the Cold War as a bad dream and move on. Only reunification with India can save Pakistan. TO STOP the Taliban, India and Pakistan need to reunite like the two Germanies. Well, if you look at it from one point of view, the political entity that is India, was a creation of the British in 1947 and so was Pakistan. So why be shocked over such a statement? Simply because we think that the Pakistani is an alien who has grabbed some land from us and colonised it. Nothing could be further from the truth. We all are Pakistanis and all Pakistanis are Hindustanis whether they like it or not. I can understand a war between different races and different ethnic groups but when people who speak the same language, have the same customs and traditions and features and like the same food squabble, it makes no sense at all. The only explanation for it could be sibling rivalry, which has been the basic premise for all historical and political changes in India. The idea of Paksitan was first dreamt about by a poet Sir Mohd Iqbal, the man who also wrote Sare jahan Sey accha Hindustan Hamara. The British for political reasons and to divide the Indian Army that had won two world wars for them decided to partition the country. Here Sir Tej Bahadur Sapru (KCSI) who was offered to the Chair of the President of India later had suggested that Congress give up the demand for Purna Swaraj and go in for Dominion Status like Austaralia. It would put an end to the British excuse that the country had to be partitioned for Independence. However, this would mean that the British sovereign would be the Head of state in India instead of an Indian President. But apart from Gandhiji no one had the same idea. Everyone wanted complete Independence. Gandhi even offered that Jinnah be made Premier of United India. No one then knew that Jinnah would die soon, had they known so, maybe things would have gone differently. Jinnah was the best possible example of a leader who was modern and farsighted but he did not offer the Namaz, he did not forsake pork and he did not refuse wine. Jinnah was a non-practising Muslim and the person least likely to be a Pakistani premier. However fate decided that he should lead Pakistan. While the Maulvis and Maulanas and Imams cried themselves hoarse in Delhi begging people not to leave for Pakistan saying that there would be no one left behind to offer Fatiha on the graves of their dear departed, the British prevailed and a poets dream took form. Today Iqbal’s dream has become a nightmare, in which every child carries a grenade and a gun. Its leading lady Benazir was killed by the militants in Pakistan and this will embolden them to take action against other political leaders with impunity. This operation came about in LTTE fashion like the Sri Lankan Tamil Extremists and reminiscent of the manner, in which Rajiv Gandhi was killed in India. Emboldened by this act the militants may carry out similar raids against political leaders in poorly policed states of India like Uttar Pradesh and Bihar too. The extremists want control of Pakistan but they will not get it so easily, there will be riots and vendetta and arson and killings in such a heavily armed civilian population. The only solution to terrorism lies in a confederacy between India and Pakistan or the reunification of India the way the two Germanys united. It is time we break the Berlin wall of caste and communal politics that has separated the two countries. Only then will there be an end to the killing. It is a sad commentary on the Indian political class that first time in the history of independent India, the armed forces decided to appeal for justice to the political masters against the ongoing mischief of bureaucrats over the Sixth Pay Commission. EVEN THE uninitiated is aware that in modern day warfare armed forces the world over have to be always ready to launch into combat at a moment’s notice. A case in point is the recent Mumbai carnage. Nevertheless the Babus sitting in PMOs office recently issued a rider related to Sixth Pay Commission that only those officers of the Lt. Colonel rank in the armed forces will be granted fourth pay band who are in combat or ready to combat state. Needless to say it clean bowled even that small minority in the armed forces who still believe in the words of the Neta-Babu Combine running this country. This needless controversy has taken lot of man-hours and frayed tempers to resolve. It is a sad commentary on the Indian political class that first time in the history of independent India, the country’s armed forces decided to appeal for justice to the Indian political masters against the ongoing mischief of the bureaucrats concerning the Sixth Pay Commission. These gentlemen are ever ready to bring down the stature of the armed forces, but so much are the Indian politicians under the influence of these Babus that they dare not annoy them. There is just no reason why the armed forces should get inferior pay and perks as compared to their pen pushing civilian counterparts in the IAS and other central services working from their plush offices on an eight hour time schedule. What is so special that these Babaus are doing for which they must get additional pay and perks? They do not even have accountability. Even after the GOM which was set up by the Prime Minister to look into the grievances of the armed forces concerning the Sixth Pay Commission grants, has accepted most of the demands including the contentious one of granting Lt. Colonels and its equivalent rank in the armed forces the status of fourth pay band, as was there in the Fifth Pay Commission, the Babus sitting in the PMOs office had put in a rider that all those Lt. Colonels who are on deputation to Para Military Forces and Assam Rifles will not get this benefit. This is really funny. An IPS or IAS officer whether on deputation or not can get all the benefits but not an armed forces officer. Needless to say it was rejected by the Services Headquarters giving rise to another round of confrontation and has only now been resolved. Since 16 December 2008 ex-servicemen are on relay hunger strike still nobody is taking any notice. A large number of ex–servicemen and their families in disgust have returned their most cherished possession, the medals of gallantry earned by them in defending their beloved country including making supreme sacrifice of their lives, back to the President of India, after a rally on 8 February 2009 in New Delhi. 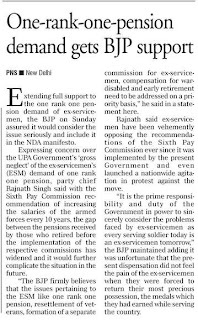 These ex-servicemen are protesting the raw deal given to the armed forces in the Sixth Pay Commission. If this had happened in any other country it would have shaken up the entire nation but not MERA BHARAT MAHAN and its power brokers the NETA-BABU COMBINE. They have sufficient money stashed away in Swiss Bank Accounts to bother about what damage all this is doing to the morale of the armed forces in particular and security of the country in general. In Britain and America, the two oldest democracies of the world, the best-paid organization are their armed forces. So why not in India? At least they can be paid at par with these Babus? Why should the cream of Indian youth join the armed forces if they are made to feel that they can get better pay and perks as also a comfortable life in pen pushing and no accountability jobs? In any case why should there be a common pay commission for civil services and armed forces with all this jugglery going on for parity? Armed forces have absolutely different working conditions and job requirements then their civilian counter parts. There should be a separate pay commission for the armed forces which is a long-standing demand of theirs. Incidentally this request of the armed forces has now been conceded by the GOM. However for its implementation the forces will have to wait for ten more years. In America an Army General, Eisenhower was President, General Colin Powell was the Secretary of State during the first tenure of Bush. In the new American President Obamas cabinet, two of his ministers are former generals. In Britain the future King as a tradition has to serve in the Navy, so why in India are members of the armed forces both serving and retired kept away from the process of decision making even in matters concerning national security? The current National Security Adviser is a policeman. Before him it was a bureaucrat. If the government can pass a law that medical students will have to serve for some time in rural areas before they will be given their degree then why cannot a law be passed making five years military service compulsory for all IAS and IPS officers and officers of other central services after they get selected? This apart from taking care of crippling deficiencies in the officer cadres of the armed forces will imbibe love for the country and sacrifice to these budding bureaucrats. What better way to serve the nation by the bureaucracy? If India wants to be counted in the world as a power then it has no option but to have a lean and mean military force that must be kept well fed, paid, equipped and trained. Democracy or not we Indians have to learn that in international arena there is still a Jungle Raj, which is functioning on the principle of the survival of the fittest. The power still comes from the barrel of a gun. The recent Mumbai carnage should motivate the Neta-Babu combine of this country to wake up before it is too late. 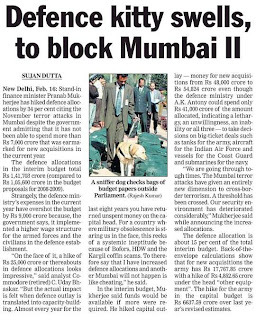 Considering the changed security scenario in view of the Mumbai terror attacks, the government today allocated Rs 1,41,703 crore for defence sector, almost a 35 per cent increase from the previous year's budget provisions. Last year's allocation for Defence stood at Rs 1,05,600 crore and the current increase amounted to Rs 36,103 crore. Presenting the Interim Budget for 2009-10 in the Lok Sabha, Finance Minister Pranab Mukherjee said the allocation has been increased because of the prevailing security environment, which has "deteriorated considerably". Noting that the Mumbai attacks had amounted to the threshold being crossed on the security front, Mukherjee said, "We are going through tough times. The Mumbai terror attacks have given an entirely new dimension to cross-border terrorism." With the total revised expenditure for Defence last year standing at Rs 1,14,600 crore, he said the increased Plan expenditure for Defence this year would be Rs 86,879 crore. Last year's Plan expenditure was only Rs 73,600 crore, thereby providing an increase of Rs 13,279 crore this year. To validate the concept of flexi-use of airspace to fight battles and to secure the peninsular skies including the coastal belt, the Indian Air Force is all set to carry out the second edition of its mammoth exercise Dakshin Prahar from February 18. The week-long unique operational exercise under the Southern Air Command assumes significance in the wake of the Aero-India show held in Bangalore last week and will reflect the IAF's ability to sustain operations for a prolonged period of time. The SAC would deploy its state-of-the-art fighter aircraft such as Su-30MKI, Mirage-2000 and upgraded versions of maritime Jaguar in order to cover its vast area of responsibility including the peninsular region and offshore installations on the east coast and, Lakshadweep and Minicoy Islands in the south-west. "All the combat aircraft have capability for air-to-air refuelling by the IL- 78 tankers which are strategically positioned to increase the reach of fighters to go around the peninsula without refuelling," an IAF spokesperson said in New Delhi. The transport aircrafts An-32s and Avro, and Mi-8 helicopters would provide vital support and perform communication duties during the exercise. "The aircrafts would practice modern tactics in carefully crafted corridor in coordination with the Airport Authority of India so that civil and military air operations can be conducted smoothly and simultaneously," the IAF spokesperson said. The SAC air officer commanding-in-chief, Air Marshal S Radhakrishnan said, "The air exercises of this nature not only increases the operational preparedness of the IAF but also strengthens the process of coordination between the AAI and the IAF for handling and eventuality requiring use of combat air power at short notice." Earlier, whenever major operational exercises were held by the IAF, tight restrictions were placed on the use of the airspace. Such restrictions would have caused severe disruption in day-to-day air traffic in the booming civil aviation sector. Last year, when the exercise was conducted for the first time, SAC and AAI displayed exemplary coordination with interaction at every level, joint-manship from the planning stage and successfully executed an intricate exercise. The Taliban have become a threat for the Pakistan army like the Mukti Bahini in then East Pakistan (now Bangladesh) in 1971. A furious Taliban leadership has decided to send their fighters to Islamabad as a reaction to the army operations in the Swat valley on the troubled border with Afghanistan. The Taliban have already started painting walls in Islamabad with its threats, compelling the administration in the capital to erase these messages quickly. Many religious scholars in Islamabad have received messages from the Taliban that they have only two options: They must support the Taliban or leave the capital else they will be considered collaborators of the 'pro-American Zardari government' which they consider not different from the previous Pervez Musharraf regime. It is also astonishing that the Taliban in Swat and Bajour have included the names of some religious and jihadi leaders in their hit-lists only because they are not ready to fight against their countrymen. The Taliban have accused some militant leaders in the tribal areas and some leaders of the Lashkar-e-Tayiba, the Harkat-ul Mujahideen and the Hizbul Mujahideen of trying to stop youngsters from fight against Pakistani forces. The Taliban have declared all these pro-Pakistan militants as their enemies. It is learnt that the names of Maulvi Nazir from South Wazirastan, Hafiz Gul Bahadur from North Wazirastan, Lashkar founder Hafiz Mohammad Saeed, Maulana Farooq Kashmiri and Syed Salahudin of the Hizbul Mujahideen have been included on the Taliban hit-list. The Taliban have threatened some Hizbul Mujahideen leaders in Swat and Dir to leave the area soon. Another Taliban leader in the Mehmand agency, Maulvi Omar Khalid, has threatened Lashkar militants to leave the tribal agency, because they were only interested in fighting foreign troops in Afghanistan or against India. According to Khalid, this meant they do not want an Islamic government in Pakistan. This complicated situation has forced the Pakistan government to take some extreme steps against the Taliban in Darra Adamkhel and Swat. The Taliban killed Polish engineer Piotr Stannczak as a reaction to a big operation in the area. Some diplomatic sources have revealed that Pakistan was ready to release some arrested Taliban fighters in exchange for the Polish engineer and another kidnapped Chinese engineer, but the US raised some objections and the deal was not finalised. The Pakistani authorities successfully negotiated the release of kidnapped Pakistani diplomat Tariq Azizudin in 2008 and the release of kidnapped army personnel in 2007 by releasing some Taliban fighters. 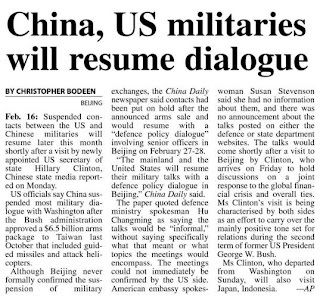 This time, US pressure complicated the situation. Though it confronts an East Pakistan-like situation from Darra Ademkhel to the mountains of Swat, the Pakistan army is not ready to surrender despite the fact that India is once again trying to exploit the situation by using threatening language against Islamabad. The Pakistan foreign office is under diplomatic pressure after the Polish engineer's brutal killing to 'do more' for the release of the kidnapped Chinese engineer, an Afghan diplomat, an Iranian diplomat and a UN diplomat kidnapped in Quetta, but the civilian and army leadership have decided not to bow down. Reliable sources have revealed that kidnapped Chinese engineer Long Xiao is seriously ill in the Taliban's custody in Swat. He was kidnapped last August along with another colleague, Zhang Guo. Both men tried to escape. Long was injured and recaptured by the Taliban, but Zhang escaped. The Taliban want two dozen arrested fighters in exchange for Long, but the Pakistani authorities are not ready to accept this. Afghanistan's Ambassador to Pakistan Abdul Khaliq Farahi was kidnapped last year and has still not been found. Some sources allege he was kidnapped over a personal issue at the behest of his in-laws. The Pakistani authorities are conducting a big search operation not only for him, but also for Iranian diplomat Heshmatollah Attarzadeh who was kidnapped from Peshawar last year. After the army intensified its operations in Swat, half a million people out of the region's estimated 1.5 million population have left the area in the last month. A top army officer linked with the operation in Swat said the "situation in Swat is much more complicated than East Bengal in 1971 where we were fighting against Indian-sponsored secular insurgents. The local population in East Bengal was fully supporting the insurgents, but the ground reality of Swat is very different. We are fighting the Taliban and they are demanding the enforcement of Islamic law in Swat and all the local political leaders are supporting this demand under public pressure." North West Frontier Province Chief Minister Ameer Haider Hoti of the Awami National Party, Governor Awais Ghani and the army high command have strongly recommended that the fedaral government enforce long pending Sharia regulation, which will be called Nafaz-e-Adal regulation. Swat district police officer Dilawar Khan Bangash said the Taliban will have no justification to fight the state after the enforcement of Islamic law in Swat. Swat was a princely state till July 28, 1969. The Islamic state of Swat was established in 1849 by Sayyed Akbar Shah. The state of Swat was kept in abeyance from 1863 to 1926, but Sharia law prevailed through Qazi courts during this period. The courts were restored by the British in 1926. Qazi courts operated till 1969 when Swat finally became part of Pakistan. Residents of Swat think it was easy to get justice before 1969 through the Qazi courts, but after the imposition of Pakistani law, the poor do not get justice. The Taliban have exploited the delay in justice and instigated the poor to rise against big landlords. The ANP swept the 2008 election with the slogan of peace and justice and now rules the NWFP in collaboration with the Pakistan People's Party. Reliable sources say the ANP leadership have convinced President Asif Ali Zardari to promulgate the Sharia regulation in Swat and the promulgation will be announced in a few days. It is learnt that prominent rebel leader Maulana Sufi Muhammad of the Tehrik-e-Nafaze Shariat Muhammadi has assured the ANP leadership that he will start a long march from Dir to the Swat valley after the imposition of Sharia law. He will appeal to his son-in-law Maulana Fazalullah and other Taliban leaders to lay down their arms. He told ANP leaders that if the Taliban does not surrender its arms, then he will support army operations against them. About a dozen Special Operation Group (SOG) personnel were injured when a landmine planted by maoists blasted their vehicle in Orissa's Gajapati district today, the police said. The blast near Andheri Ghati under the Adaba police station, about 120 km from here, took place when the SOG personnel were on a combing operation in the maoist-affected area, Superintendent of Police SA Khan said. The injured were taken to a nearby hospital where the condition of two was stated to be serious, he said. PESHAWAR, Pakistan (AP) — Pakistan agreed Monday to suspend military offensives and impose Islamic law in part of the restive northwest, making a gesture it hopes will help calm the Taliban insurgency while rejecting Washington's call for tougher measures against militants. A U.S. defense official called the deal "a negative development," and some Pakistani experts expressed skepticism the truce would decrease violence. One human rights activist said the accord was "a great surrender" to militants. Elsewhere in the northwest, missiles fired by a suspected U.S. spy plane killed 30 people in a house used by an extremist commander, witnesses said. It was the deadliest of almost three dozen apparent American attacks on al-Qaida and Taliban targets in the semiautonomous tribal lands close to the Afghan border since last year. Monday's peace agreement applies to the Malakand region, which includes the former tourist destination of the Swat Valley, where extremists have gained sway by beheading people, burning girls schools and attacking security forces since a similar agreement broke down in August. U.S. officials complained the earlier accord allowed militants to regroup and rearm and urged Pakistan's government to concentrate on military solutions to the insurgency in the rugged frontier region, where al-Qaida leader Osama bin Laden is believed to be hiding. The new agreement intensified that unease. "It is hard to view this as anything other than a negative development," a senior Defense Department official said. He spoke on condition of anonymity because of the sensitivity of relations with Pakistan and because he was not authorized to speak on the record. A White House spokesman, Tommy Vietor, said later: "We have seen the press reports and are in touch with the government of Pakistan about the ongoing situation in Swat." 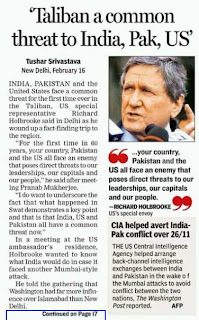 Speaking in India, President Barack Obama's special envoy for the region, Richard Holbrooke, did not directly address Pakistan's peace effort in Malakand. But he said the rise of the Taliban in Swat was a reminder that the U.S., Pakistan and India face an "an enemy which poses direct threats to our leadership, our capitals and our people." The government in northwestern Pakistan announced the deal after officials met with local Islamic leaders who have long demanded that Islamic, or Shariah, law be followed in this staunchly conservative corner of Pakistan. Among the participants was a pro-Taliban cleric who authorities said would return to Swat and tell militants there to disarm, although there was no mention in the agreement of any need for extremists to give up their weapons. Many analysts questioned whether the fighters would listen to the cleric and said they doubted the deal would stop violence. Critics asked why authorities were responding to the demands of a militant group that has waged a reign of terror. "This is simply a great surrender, a surrender to a handful of forces who work through rough justice and brute force," said Athar Minallah, a lawyer and civil rights activist. "Who will be accountable for those hundreds of people who have been massacred in Swat? And they go and recognize these forces as a political force. This is pathetic. The Swat Taliban, which had said Sunday it would observe a 10-day cease-fire in support of the government's initiative, welcomed the deal. "Our whole struggle is for the enforcement of Shariah law," Swat Taliban spokesman Muslim Khan said. "If this really brings us the implementation of Shariah, we will fully cooperate with it." Several war-weary residents interviewed in the Swat area welcomed the announcement. "We just want to see an end to this bloody fighting," said Fazal Wadood, a teacher. "We do not mind what way it comes. It is no problem if it comes through the Islamic system." Pakistan's shaky civilian government is under intense domestic pressure to retake control of the Swat Valley, although many Islamist lawmakers and other Islamic groups have urged it to negotiate with the militants. Amir Haider Khan Hoti, chief minister in North West Frontier Province, said troops in Swat would remain there but stop offensive operations and go on "reactive mode," retaliating only if attacked. He stressed they would not leave the valley until the militant threat was over. A spokesman for the army said militants would have to live up to the truce deal. "At the moment, the military has been asked to hold back and allow the peace initiative there," Maj. Gen Athar Abbas said. "But it is to be seen whether they (the militants) follow this cease-fire in true letter and spirit or take undue advantage of it." Hoti said the main changes to the legal system promised by the accord already are included in existing laws stipulating Islamic justice. But he said they would be implemented only after peace was restored in the valley. Hoti said the laws, which allow for Muslim clerics to advise judges when hearing cases and the setting up of an Islamic appeals court, would ensure a much speedier and fairer justice system than the current system, which dates back to British colonial times. The rules do not ban female education or contain other strict interpretations of Shariah that have been demanded by many members of the Taliban in Pakistan — restrictions imposed by Afghanistan's Taliban regime that was ousted by the U.S.-led invasion in late 2001. The accord does not involve the tribally ruled regions adjacent to the Afghan border, where the United States has been targeting suspected militants with missile strikes fired from drones believed launched from neighboring Afghanistan. Monday's attack was the first in the Kurram area. Rehman Ullah, a resident of Baggan village, said drone planes were seen in the sky before the attack on the house. He said he counted 30 bodies dug out of the rubble. A Pakistani intelligence official said field informants reported militants showed up at the village bazaar and ordered 30 caskets. He spoke on condition of anonymity because he was not authorized to speak to media. The Obama administration has signaled it will continue such attacks, which U.S. officials say have killed several top al-Qaida leaders. Pakistani leaders have voiced strong objections, saying the strikes undercut support for their own war against militants. Associated Press writers Ishtiaq Mahsud in Dera Ismail Khan, Nahal Toosi in Islamabad and Pauline Jelinek in Washington contributed to this report. On 4 February, 2009, India's foreign secretary Shiv Shankar Menon, while speaking at a Foreign Affairs' conference in Paris, alleged that the "perpetrators of Mumbai attacks were and remain clients and creation of the ISI." On 7 February, India's army chief General Deepak Kapoor said that the number of militant camps in Pakistan (read 'hostile to India') has increased "in the past year." 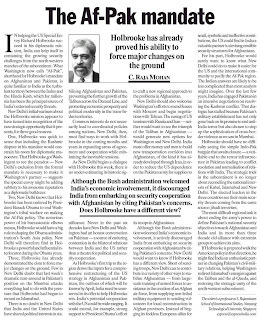 This was his appraisal of an administration that, since coming into office, made unprecedented concessions to India. Congress Party spokesman Manish Tiwari commented on Dr. Qadeer's release by calling upon the international community to consider declaring Pakistan a terrorist country. These statements negate the tenets of nuclear détente and economic interdependence. Key Indian officials have started crossing the Rubicon diplomatically, pronouncing statements that forebode war instead of peace. India seems complacent about Pakistan's nukes. Its complacency may stem partly from Pakistan's internal security situation and partly from the fact that in US's Afghan war, Pakistan is now defined as ground zero. The imperatives of social responsibility dictate that Islamabad start preparing its citizenry for war. Failure to do so would be criminally negligent. 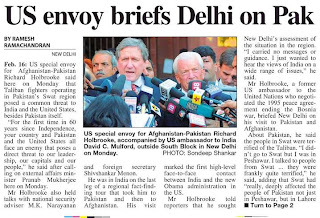 The reference point of India's plausible war against Pakistan will be Bushism, i.e. an all out military war, allegedly to annihilate terror sanctuaries constituting threat to Indian security. This calls for mass civil defense preparation. The paradox of Pakistan's war against Talibanization is leading it to expand its internal area of threat during plausible confrontation with India. The more Pakistan shatters its internal security by bombing its population, the more domestic militancy spreads. 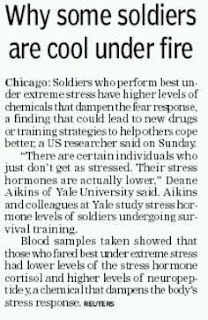 Besides inducing battle fatigue in Pakistani soldiers, this could also result in India targeting dense civilian areas as "militant hideouts" in a terrorizing aerial blitz, a hallmark of Bushism. Further, Pakistan's vulnerability to domestic terror attacks during the war also increases. The civil defense training introduced by Z.A. Bhutto to college campuses in the seventies was conducted in an inane manner. Sixty percent of the time women guards, including myself, underwent training in synchronized marching and the remaining forty percent was taken up by target shooting practice, excluding all other aspects of civil defense. This should not be repeated. The monumental task of civil defense can be facilitated through the induction of retired military personnel in the system and can be organized by creating specialized units in an integrated approach. The pattern of electoral districts can be used to organize a civil defense coordination committee in each district. Pakistan's skilled and unskilled labor force can be harnessed to create teams trained in constructing shelters, reinforcing damaged buildings, repairing bridges and roads, removing debris, and repairing water systems. The police will need assistance in maintaining public order. Fire brigades will need to be supplanted in order to deal with large fires in more vulnerable areas of the city. Effective communication and transportation, adequate and smooth functioning shelters, maintenance of law and order, and fast and effective medical services are guarantors of successful civil defense. Private and public partnership for transporting casualties should be ensured through enlistment of commercial transporters. Availability of fuel should be ensured. All Schools should carry out emergency evacuation drills. Symbols should be designated to show the location of a shelter. Specialized duty training such as blood collection, food and water distribution, increasing shelters capacity, etc should be provided to distinct groups in each mohalla. Measures necessary to mitigate vulnerability of cities to air raids need to be adopted, including deployment of anti aircraft weaponry in city's parks and window covering with adhesive paper to prevent injuries from flying glass. There should be countrywide meetings of "Doctors for Disaster Preparedness". Non medical personnel such as medical students, vets, dentists, nurses, lab technicians and pharmacists can be valuable in supplanting doctors. Every doctor in the country should know where he/she fits into the civil defense scheme. All luxury hotels in the country should agree to lend their space to shelters or hospitals should there be need. One assumes that after joining the nuclear club, Pakistan's medical students are required to study the effects of nuclear war and should receive training in medical civil defense. Preparation is in order not only for nuclear war but also for nuclear terrorism. Scenarios of missile attacks with chemical weapons should be rehearsed. Need for gas masks should be examined. Conventional shelters do not protect against chemical weapons, hence citizens need to be instructed in building sealed shelters. Simulations should include attempts by terrorists to carry out large scale terror attacks during the war. Radio, television and newspaper columns should be utilized to spread information on dealing with unexploded bombs. TV channels should telecast lectures on civil defense. Public address systems should be tested. Rationing and stock piling for emergency should begin without delay. Media should scrutinize medical stockpiles. Government must maintain a civil defense website. People should be instructed to prepare DVDs for continued access to information incase internet is disrupted. Eurocopter, the global leader in helicopter manufacturing, will be showing a strong presence at Aero India 2009, the premiere defence Airshow in Asia, and will demonstrate that it is ready to offer what India needs for its helicopter requirements thanks to its wide range of products. Indeed, Eurocopter has a long tradition of cooperation with India. Eurocopter’s has had a partnership with India’s leading local industrial company Hindustan Aeronautics Limited (HAL) since 1962. Starting with enabling HAL to manufacture more than 600 helicopters of the Alouette 3 and Lama type (Cheetah/ Chetak), the relationship strengthened further with Eurocopter outsourcing exhaustive Ecureuil work packages to HAL for the global market. Today, HAL is part of Eurocopter’s global supply chain by producing Ecureuil/Fennec airframes. In 2009, in the military environment, Eurocopter has a market share of 55%, comprising HAL-made helicopters, whereas it holds a market share of about 50 % of the civil helicopter market. Flying high on the international success of its wide range of products, Eurocopter will be showcasing models of its military range which are proposed to the Indian armed forces like Fennec, Tiger and EC725. FENNEC is a reference helicopter regarding Extremely Hot / Desertic operations and, since 2005, it has demonstrated the capability of landing on the Top of the World, Mount Everest as well as on the Siachen Glacier in the Indian Himalaya. The AS550 FENNEC is also the only military certified helicopter in the world corresponding to the Indian Armed Forces requirements for Reconnaissance & Surveillance helicopters. In addition to this the FENNEC is the only one that exists in NAVAL military configurations available in both single or twin engine versions. The AS550 Fennec single-engine helicopter is in operation with the Singapore Armed Forces, the Royal Australian Army, the Brazilian Army and Air Force, the Danish Army, the French Army and the United Arab Emirates Army. Over 3,200 helicopters of the family have been ordered, of which over 2,500 have been delivered and are operational in over 70 countries. The Tiger is the only combat helicopter in its class designed for the scenarios of the 21st century. It is the latest generation Attack Helicopter available on the market and already selected by different countries. It is considered the most multifunctional helicopter in the world. It is available in two basic versions the HAP combat support helicopter and the UHT anti-tank version, the first initially designed for the French Army and the second for the German Army. 2 versions having then derived from HAP, ARH for Australia and HAD for Spain and France. The Tiger is currently the most modern combat helicopter in the world. In total, 206 aircraft have been ordered by France, Germany, Australia and Spain, and 48 Tigers have already been delivered. These aircraft have recorded more than 13,000 flight hours. Originally designed to perform various missions, including SAR, Combat SAR, long distance tactical transport missions, the EC725 can also perform medical transport and logistical services. Additionally, it can be perfectly fitted for naval missions. It is an upgraded version of the internationally successful Cougar family. The aircraft has an exceptional fuel capacity and boasts a flight endurance of five-and-a-half hours. The EC725 includes “In Flight Refuelling” capabilities from an Air Tanker Aircraft, making this helicopter capable of very long distance deployment in hostile areas. Similarly, the EC725 is one of the very few helicopters in the world being equipped with a “Full De-Icing System”, allowing it to be totally immune to weather limitations, even in extremely cold and icy environment.. Till November 2008, 96 EC725 had been ordered by 17 different countries. More recently, the Brazilian armed forces also recognized the multi-role capability of the aircraft and signed a contract for 50 EC725 helicopters. NEW DELHI -- In the wake of last November's Mumbai terror strikes, which revealed weaknesses in India's homeland defense capacity, India's inability to fight a full-fledged war is now being increasingly exposed. Years of political neglect, corruption, red tape and indecisiveness have left the Indian Army (and to some degree the Navy and the Air Force) without the wherewithal to fight a protracted war against neighbor Pakistan, let alone more powerful China. Problems with India's defense modernization program -- valued at more than $50 billion over the next five years and to include new fighter jets, nuclear submarines and war ships -- mean that improvements might be further off than anticipated. Inadequacies in India's Russian-made main battle tank fleet, originally identified in a report by the Comptroller and Auditor (CAG) in 2006, continue. The report focused on India's deficiency vis-à-vis Pakistan, since Islamabad is the more immediate threat, but also because the deficit when compared to China is too glaring to be overcome in the foreseeable future. The CAG report identified quality problems in tanks, upgrades and technology transfer issues with Russia, especially in the face of Pakistan's crack fleet of about 1,300 Chinese and Ukrainian-built tanks. Last year, Army Chief Gen. Deepak Kapoor said that Russia has been delaying technology transfers on the T-90 tanks, which in turn has pushed back production in India. New Delhi had purchased 310 of these tanks in 2001 and signed a contract for another 347 in 2007. In a further sign of urgency in the face of Indo-Pak tensions, the Army last week placed a fast-track order of 4,100 French-origin Milan-2T anti-tank guided missiles (ATGMs), as the indigenous Nag missile is yet to be operational. Like other military upgrade orders, the $123 million Milan ATGM purchase had been on hold for a while, but was pushed through urgently given the conflict scenario emerging after the Mumbai attacks. Experts have also been highlighting India's inadequacies in missile capabilities when compared to Pakistan's Chinese and North Korean-backed program. India's test of a nuclear-capable BrahMos cruise missile failed last month. In the case of ballistic missiles, only the short-range (150-350 km) Prithvi are battle-ready. Though India has successfully tested longer range (700-2000 km) Agni missiles, they are yet to be fully operational and are still being inducted. Indian Prime Minister Manmohan Singh has spoken bluntly over the past few years about the state-owned Defense Research and Development Organization (DRDO) that oversees all defense production, expressing concern over escalating imports in the defense sector due to incessant delays in indigenous delivery of weapons systems. 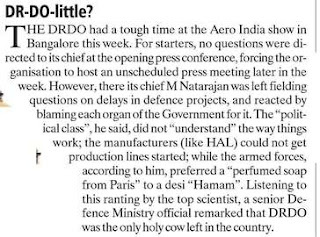 Among the severely delayed DRDO projects include the Tejas, a homemade light combat aircraft, and the Arjun, a main battle tank. And while the bigger issues receive some attention, there are myriad smaller problems. In its performance audit of defense capital acquisitions in mid-2007, the CAG cited the Army for purchasing more thermal imagers than needed, at a cost of $2 million. 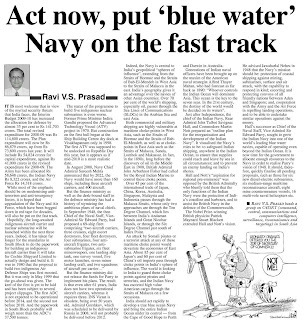 CAG also said that four frontline warships acquired by the Navy are sitting ducks for enemy submarines, as they were inducted without Sonar capability. The Navy was also cited for procuring two maritime reconnaissance aircraft, refurbished at a cost of $55 million without essential avionics and weapon systems, leading to serious limitations in their operational role. Observers say that although India has emerged as one of the biggest buyers of military hardware globally and defense deals are signed very easily and with much fanfare, there is a wide gap between planning and execution. Almost every defense contract passes through the usual cycle of taint, allegations, political brinkmanship and investigations. Despite the Indian government enacting an "Integrity Pact"" between buyer and seller to avoid kickbacks and corruption, it is well-known that middlemen and agents continue to play significant roles. However, excessive scrutiny can sometimes amount to a politically driven witch-hunt that promotes indecision at a time when Indian armed forces are in dire need of modernization. For example, a $3-billion deal signed in October 2006, to procure six Franco-Spanish Scorpene submarines from Armaris and European defense firm MBDA is currently under suspicion. Allegations have arisen that New Delhi shielded Indian middlemen who took commissions from French defense giant Thales, which owns Armaris, to clinch the deal. And in 2007, after considerable speculation, New Delhi scrapped a $600-million deal to buy 197 military helicopters from EADS subsidiary Eurocopter, saying irregularities in the bidding process were to blame. Thus, despite the Defense Procurement Policy of 2006 designed to bring transparency and speedy clearance of contracts, the defense ministry has been unable to substantially increase the pace of expenditure. The Parliamentary committee on defense reported in 2008 that $4.3 billion in funds meant to modernize India's armed forces has remained unspent between 2003-7, as deals get scrapped or delayed due to controversy and kickback allegations. Indeed, though the Pakistan economy lags India by quite a margin, the same can no longer be said when it comes to military purchases. Pakistan overtook India for the first time in 2006, signing arms deals worth $5.1 billion, as compared to $3.5 billion by India. India is by far the bigger buyer over the period 1999-2006, with agreements valued at $22.4 billion, compared to $10.9 billion for Pakistan. But clearly there is a problem in executing deals. AgustaWestland, a Finmeccanica company, and Tata Sons are announced the signature of a Memorandum of Understanding (MoU) for the formation of an Indian joint venture company which will establish a final assembly line for the AW119 helicopter in India. The agreement was signed at the Aero India air show today by Mr. Giuseppe Orsi, CEO, AgustaWestland and Mr. Ratan Tata, Chairman, Tata Sons. The joint venture company will be responsible for AW119 final assembly, completion and delivery to customers worldwide while AgustaWestland will retain responsibility for worldwide marketing and sales. The first aircraft is scheduled to be delivered from the new facility in 2011 with production forecast to rise to 30 aircraft per year to meet worldwide demand. It is envisaged that the joint venture company would be a supplier for the current Reconnaissance and Surveillance Helicopter (RSH) programme of the Indian Armed Forces, for which AgustaWestland has already proposed the AW119 to be manufactured in India. Additionally, AgustaWestland and Tata companies plan to explore additional commercial opportunities in India for AgustaWestland helicopters and the subsequent industrial co-operation.